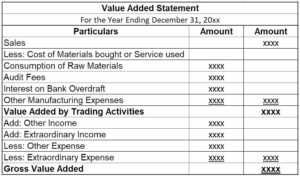 This Value Added Excel Template is a free tool provided by the Corporate Finance Institute. It will help you understand the important concept of Value added for Finance and Accounting. 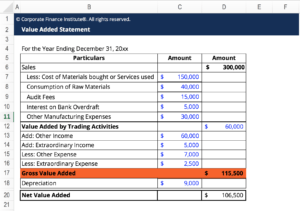 Download the Free Template and take a look at an applied example of a Value Added Calculation. The Gross Value Added (GVA) helps to measure the contribution to an economy of an individual sector, region, industry, or producer. In, other words GVA helps to measure the gross value-add by a particular product, service, or an industry. GVA is important because it helps to calculate Gross Domestic ProductGDP FormulaThe GDP Formula consists of consumption, government spending, investments, and net exports. We break down the GDP formula into steps in this guide. Gross Domestic Product is the monetary value, in local currency, of all final economic goods and services produced within a country during a specific period of time, which is a key indicator of the state of the nation’s total economy.